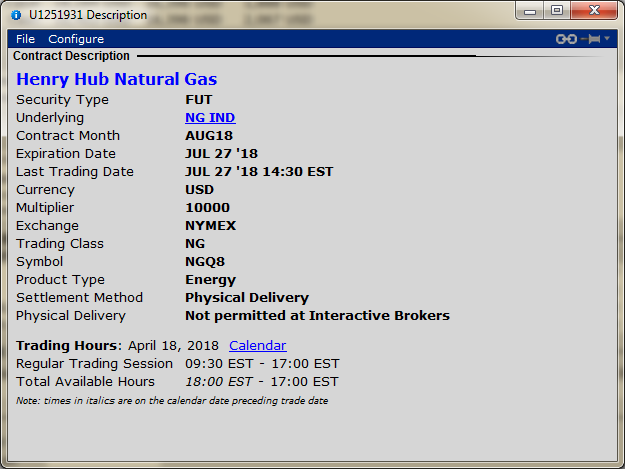 The aim is to be bullish natural gas, with the assumption that the nearer term month future will go up faster than the far month future. 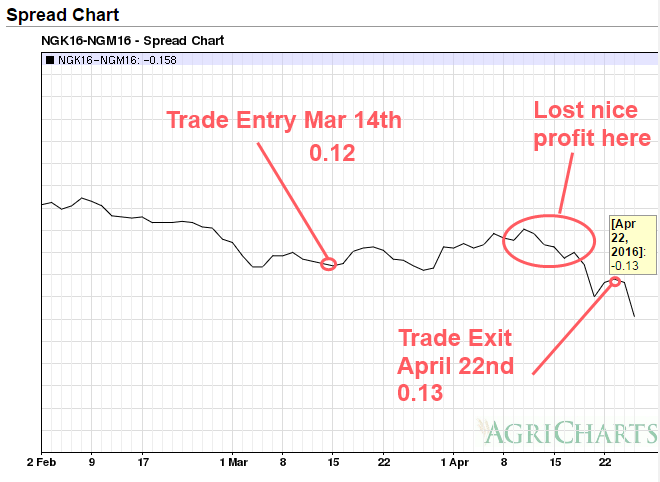 The near month future has about 45 days to go to expiration, so has time for the 30 days to pass, so it can be liquidated under the 30 day rule (as a spread). 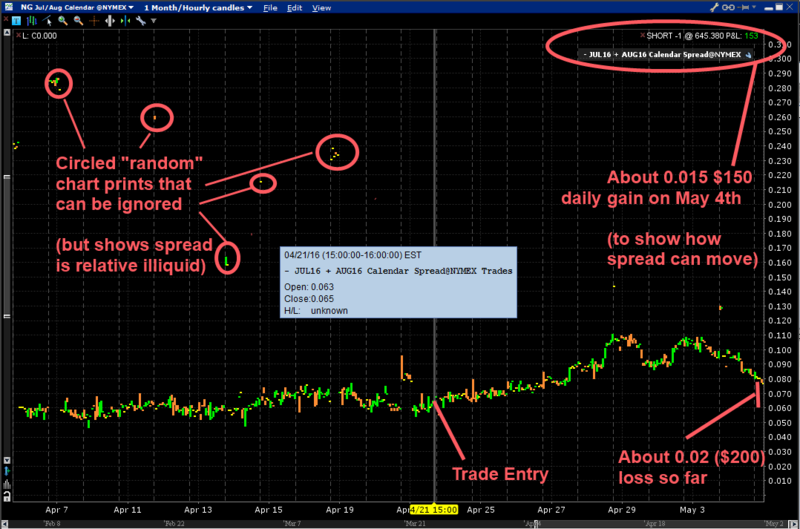 The circled “random” chart prints on the chart image can be ignored, because presumably they are not real trades – however this does show that the spread is relative illiquid. 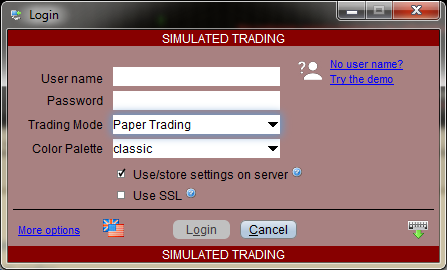 This means that should always use limit orders for trade entry and trade exit, to avoid potentially large slippage. 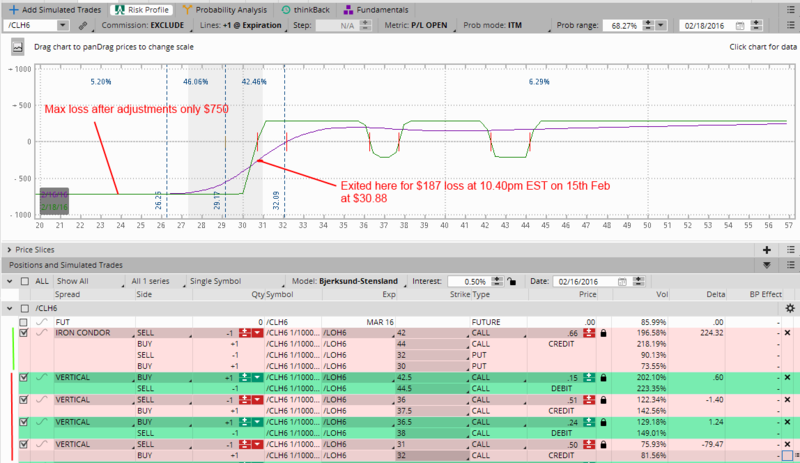 Even on 1 contract trade, this could be as much as $100 (0.01) either way throughout a trading day (check the chart) – so it can be significant to overall strategy profitability. 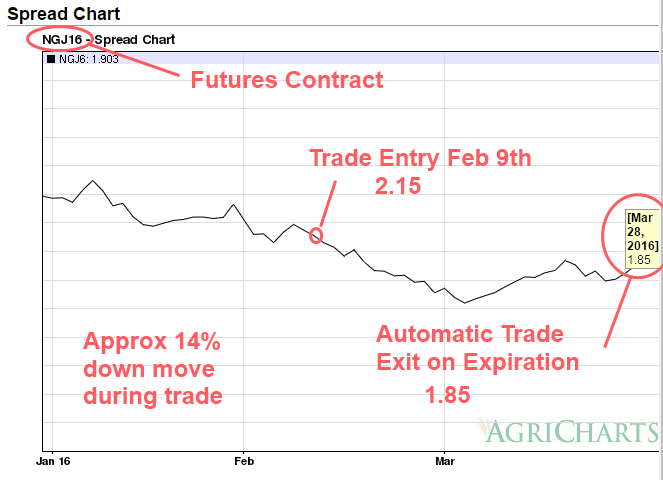 The spread can also move around between $100 and $200 (0.01 and 0.02) per day, but that is still within a manageable range on 1 future contract trade. The trade is a relative value mean reverting trade, so in theory it is not that likely to move massively in opposite direction for a long period of time – it will theoretically tend to move back into long term averages – so big spikes up or down tend to mean revert over time. The risk is that the “in theory” part is understated and the spread will lose more money than comfortable for a single portfolio position. In our portfolio this is managed by trading small enough (1 contract) to stay in the trade without worrying too much about temporary adverse moves over a few days. 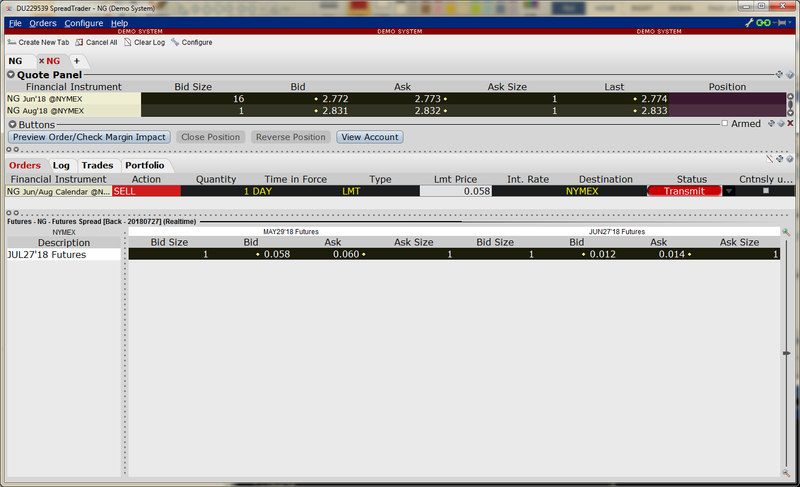 Need to stay another 2.5 weeks in this trade because of 30 day rule, but then can re-evaluate. 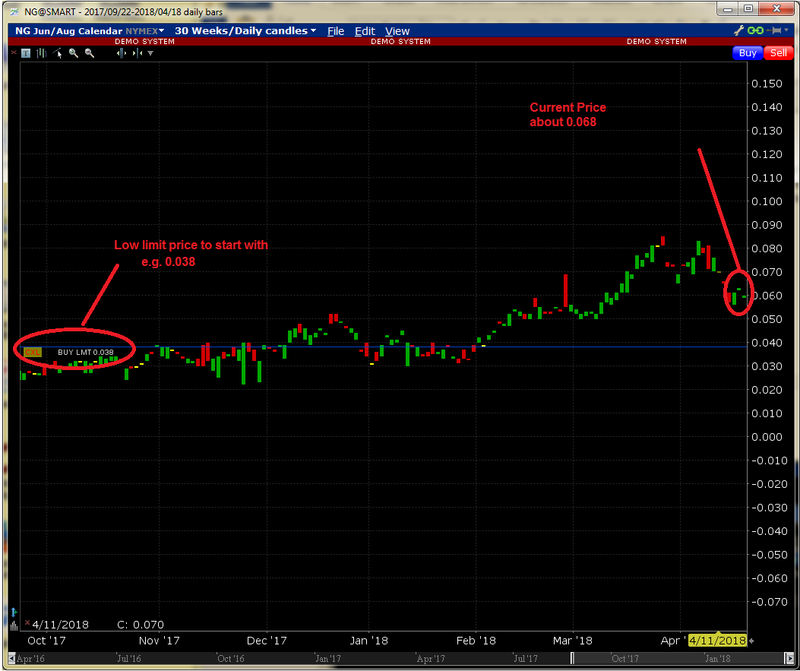 If some mean reversion has occurred and the Natural Gas /NG price has risen, the spread could come back to profitability. 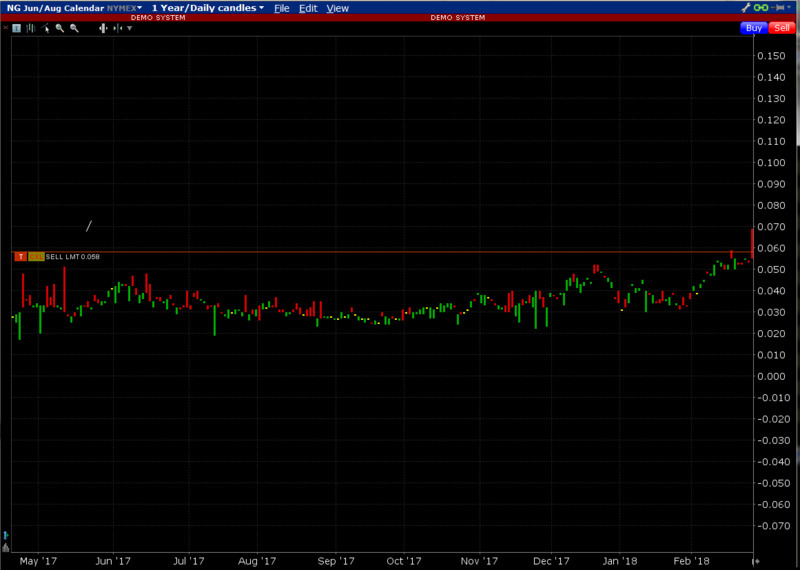 It is currently in an expected range, so no need to adjust yet. 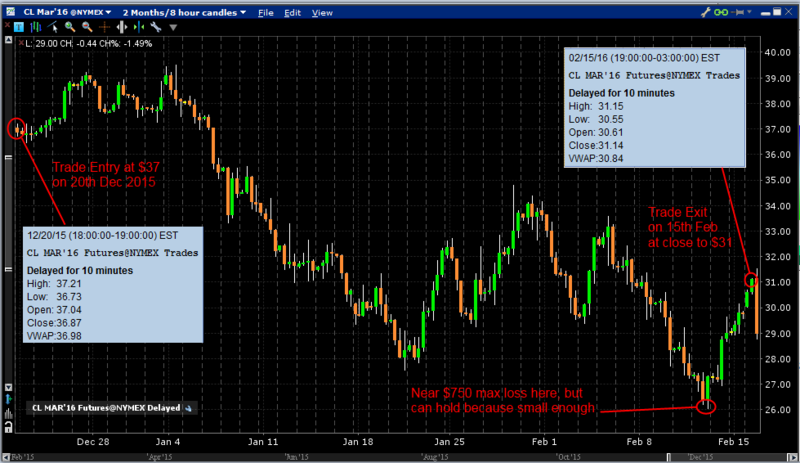 In the spirit of full disclosure on our option trading, this trade lost money. However it could have been significantly worse. The point of this post is to be honest about when things go wrong, and more importantly how to worm your way out of them to survive another day. These trades were all with the context of having a 30 day rule, but the principals can be applied to trading without those restrictions. 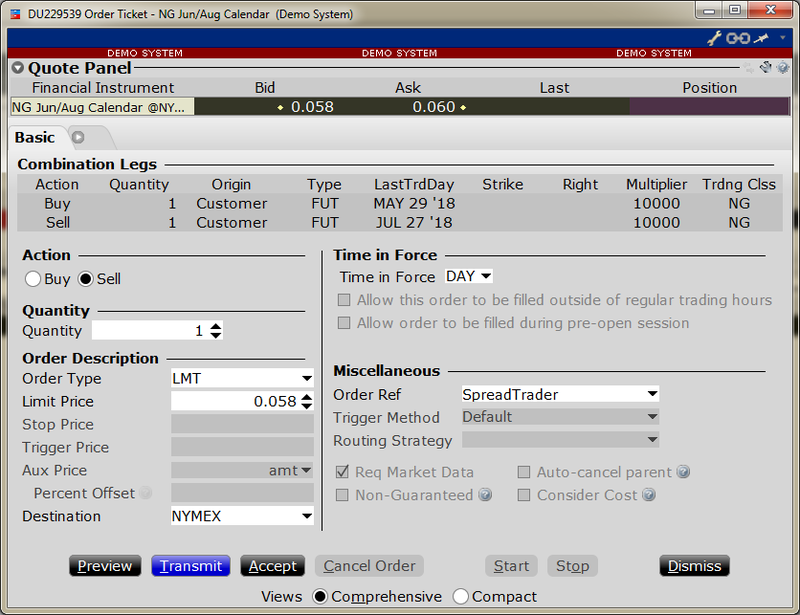 The untested short call spread cannot simply be rolled down because the original option position has not been open for more than 30 days, so that would clash with the 30 day rule. 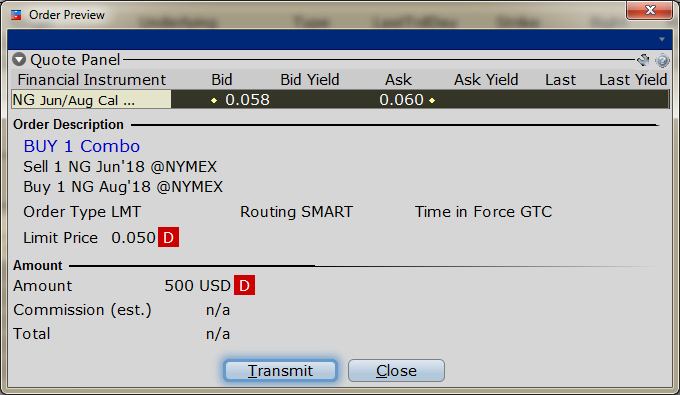 Therefore the short call spread closer to the money was added to create short delta (and reduce the long delta in the original position risk). 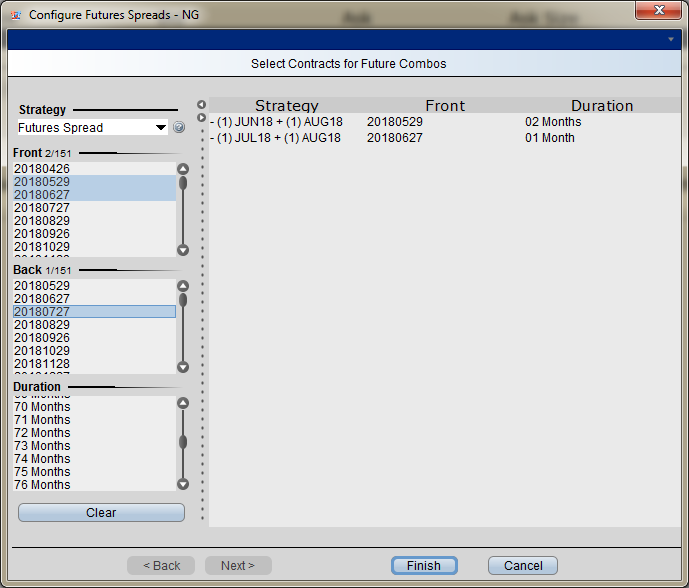 The long call spread effectively is “cancelling” out the original short call spread, trying to simulate (as close as possible) exiting the original short call spread. 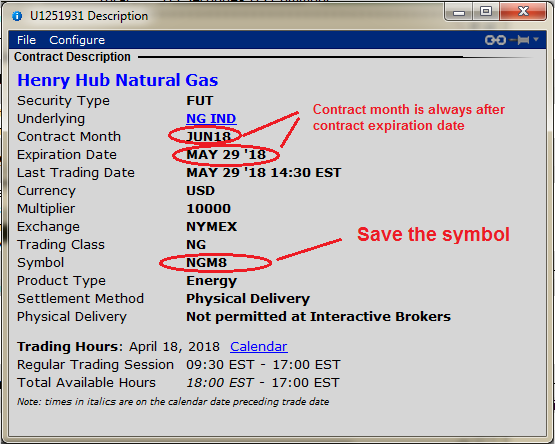 Due to 30 day rule the same contract strike cannot be traded again within 30 days – so the new long call spread uses contract strikes that are only $0.50 either side of the original short call spread strikes. 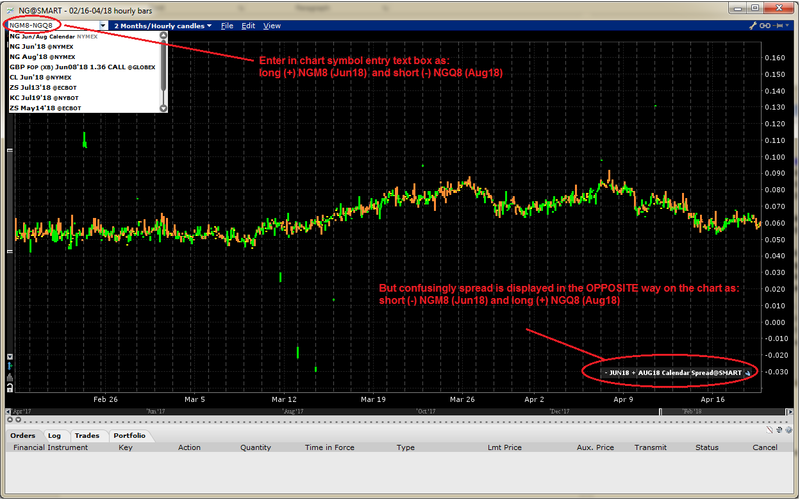 Note that both of these adjustments need to be more than 30 DTE to avoid issues with the 30 day rule. Although because of the reduced max loss, the trade could be held through big down move, ultimately exiting into a nice pop on Feb 15th as Asia opened. 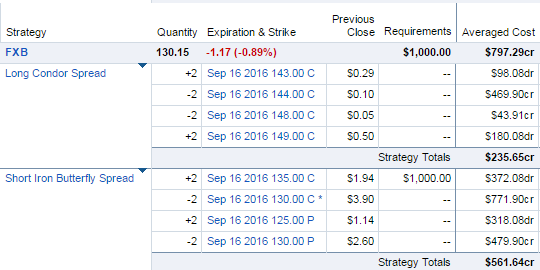 Admittedly trade ultimately lost $187 (see below) however the risk was managed using short call spreads (delta hedging) along the way. This was a quick example of how to play defensively with a position, not just “hope it all turns out ok in the end”. The techniques can be applied to defend any similar positions. 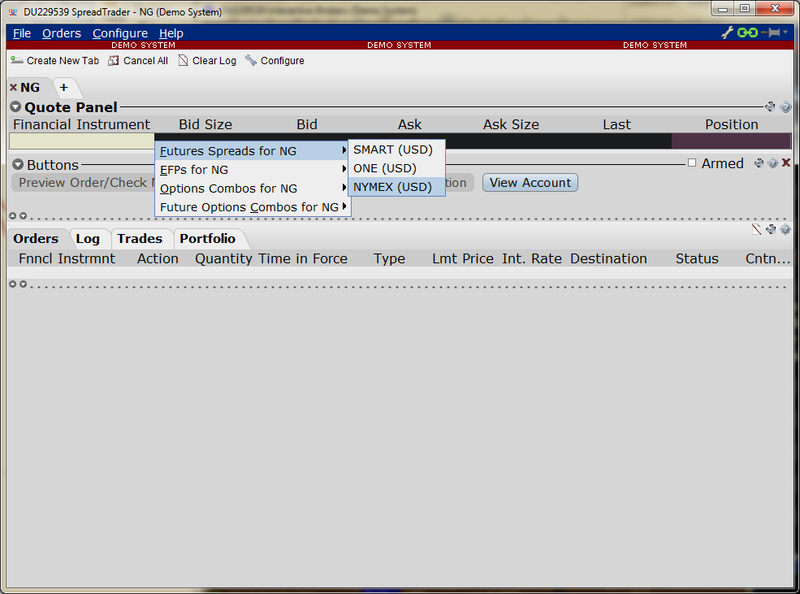 You can also learn something about option payoff diagrams and delta hedging, with a position that is going against you. 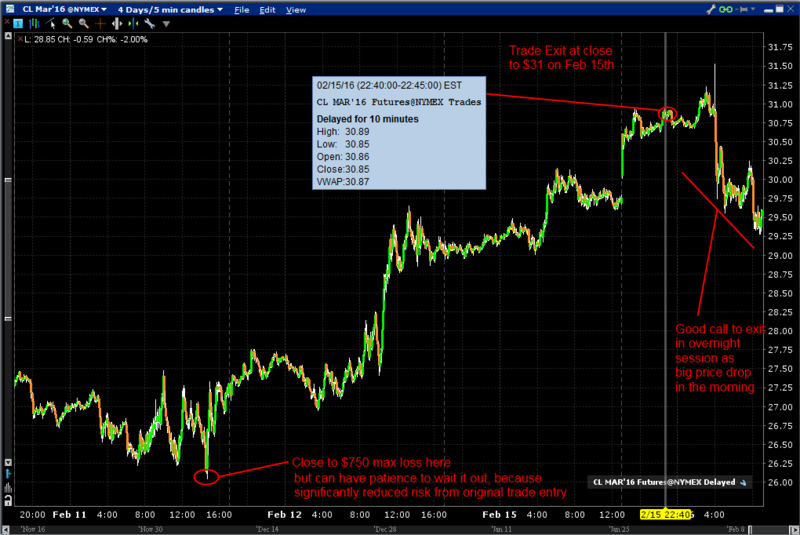 Importantly all option legs in the trade were traded as an entire position – we didn’t try to “leg” out of the individual option positions (that is time the market by exiting individual option legs separately). 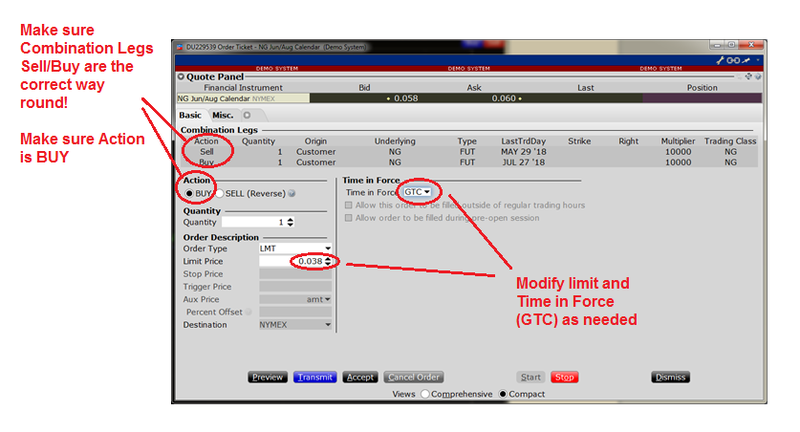 Given that approach, the entire position could not be exited until 15th Feb, because the latest trade adjustment was added on 14th Jan – so if we are going to trade the entire structure as one position then we were forced to wait at least 30 days from 14th Jan to exit. In summary the ability to manage risk on trades that go wrong, is as important as having winning trades.